Purpose: There has been an increase in awareness of the link between oral health and systemic health in recent years. While questions exist about the relationship of oral disease to cardiovascular conditions, no published study to date has addressed cardiologists' knowledge and opinions about this area of science. This study examined North Carolina cardiologists' knowledge, opinions and practice behaviors regarding periodontal disease and cardiovascular disease. Methods: A survey was developed, revised, pilot tested and mailed to 625 licensed, practicing cardiologists' in North Carolina. A total of 3 mailings were conducted. Data were analyzed using descriptive statistics. Results: The response rate was 19% (n=119). Respondents were mostly males (86%) and working in private group practice (48%) or academia (32%). Sixty three percent correctly identified the first sign of periodontal disease; however, only 18% choose the correct etiology of periodontal disease. Sixty percent of respondents stated that medical students and dental students should be trained to work collaboratively. Half of cardiologists' surveyed were unsure that treatment of periodontal disease can decrease a patient's risk for cardiovascular disease. The majority were interested in learning more about the relationship between cardiovascular disease and periodontitis. Conclusion: The majority of cardiologists surveyed were unclear about the etiology of periodontal disease and would like to have more information about the potential oral-systemic link regarding cardiovascular disease. It is important for educators and administrators in higher education to examine the need for interprofessional education and collaboration between medicine and dentistry. This study may provide valuable information about ways to implement more effective interprofessional education and collaboration between dental and dental hygiene professionals and cardiologists to improve oral health. Blaizot et al conducted a meta-analysis of observational studies using a methodological process of reviewing 215 epidemiological studies.5 The meta-analysis examined the association between exposure to periodontitis and cardiovascular disease. Of the 215 studies, 22 case-control and cross sectional studies along with 7 cohort studies were selected to use in the analysis. The results supported an association between persons with periodontal disease and cardiovascular disease. This analysis provided evidence that many of the risk factors associated with cardiovascular disease and periodontal disease are independent of each other. It concluded that further research is needed to examine the pathophysiological process between the two. Poor oral hygiene is the major cause of periodontal disease. This chronic oral infection is related to a systemic inflammatory response. Periodontal disease has been reported to cause an increase in the C-reactive protein levels in patients. Systemic inflammation could signify the mechanism that links periodontal disease and cardiovascular disease. de Oliveira et al conducted a survey to measure if self-reported tooth brushing and oral hygiene was associated with an increase in cardiovascular disease.21 The results indicated that persons with reported poor oral hygiene had a higher risk of cardiovascular disease and low-grade inflammation but the causal nature was yet to be determined. With the potential effect for periodontal disease to increase risk for cardiovascular disease, it is important for the dental and medical professions to work together to help reduce the risk for adverse outcomes for patients. In 2009, a set of clinical recommendations for patients with periodontal disease and/or cardiovascular disease was published.22 These recommendations were established to provide guidance to both cardiologists and periodontists regarding the link between cardiovascular disease and periodontitis and a potential approach to reducing the risk for cardiovascular disease in patients who have periodontitis. The recommendations were important because they represented the first of its kind between cardiologists and periodontists. The area of oral systemic health is continuing to grow in the U.S. It is important to assess the current knowledge and practices of health care practitioners' regarding oral systemic diseases. It is also imperative to examine the roles of both medical providers and oral health care providers in assessing the practice behaviors regarding patient care. Lewis et al assessed pediatricians' knowledge, attitudes and professional experience regarding oral health and to determine pediatricians willingness to incorporate fluoride varnish into their practices.24 They conducted a survey of 1,600 randomly selected pediatricians using the American Medical Association list of pediatricians. The survey assessed the knowledge, current practice and opinions on their role as a pediatrician to promote oral health. The response rate was 62% with 1,386 eligible survey recipients. Two-thirds of respondents observed caries in their school-aged patients. While the majority of respondents referred patients to a dental office or clinic, 55% reported difficulty in achieving referral for uninsured patients, and 90% agreed that they played an important role in promoting and educating patients on the importance of oral health. Owens et al surveyed 1,000 internists and 115 endocrinologists to determine their knowledge, opinions and practice behaviors regarding periodontitis and diabetes.25 The survey received a 34% response rate. Knowledge about periodontal disease was high and the respondents agreed that physicians should be taught about periodontal disease and be trained to do screenings for periodontal disease. The majority of respondents indicated that there is a link between periodontal disease and diabetes; however, the majority were not familiar with studies regarding the relationship between the 2 diseases. Although there is some evidence that there is an association between periodontal disease and cardiovascular disease, little is known about medical providers' knowledge about the link. The purpose of this study was to examine the knowledge, opinions, and practice behaviors of North Carolina cardiologists' regarding the association between cardiovascular disease and periodontal disease. A list of cardiologists was obtained from the North Carolina Medical Board. Although the list contained the names of 1,160 registered cardiologists in the state of North Carolina, only 625 were actively practicing cardiology, so surveys were mailed to 625 cardiologists. The selection criteria included cardiologists practicing full time or part time in a public, private or government practice in North Carolina. Retired cardiologists, pediatric cardiologists or cardiologists practicing outside of the state were excluded from the study. The survey was reviewed and approved by the Institutional Review Board. Following the approval, the survey was pilot tested with 5 practicing cardiologists. After minor changes, the survey was produced using Teleform, a scannable format that simplifies data entry. The survey, along with a cover letter explaining its purpose and business reply envelope was mailed using the Salent and Dillman method.30 There were 2 mailings in the fall of 2012 and a final mailing in January 2013. To maintain confidentiality, there were no identifiers on the surveys and random identification numbers were assigned to each subject. All data was stored in a password-protected database that was only accessible to the research team and statistician. The data were analyzed using SAS version 9.1 (SAS Institute Inc., North Carolina) using descriptive statistics. Forty-one percent of cardiologists refer patients to a dental facility when they express concerns about their mouth, and 31% refer if they see something that should be further examined. However, 22% never refer patients to a dental clinic or facility. In the past year, 46% of respondents reported referring between 1 to 5 patients to a dental facility due to periodontal disease, and 13% referred more than 6 patients within the last year. Respondents' answers were similar for referring a patient for tooth decay, with 43% referring between 1 and 5 patients to a dental facility for tooth decay, whereas 12% referred 6 or more patients (Table III). Cardiologists' knowledge about periodontal disease was moderate, with 70% reporting that bone loss describes periodontal disease. Sixty-three percent of respondents answered correctly about the first sign of periodontal disease as being bleeding gums, and 50% were aware that periodontal disease is an infection in the gums. Conversely, 18% described tooth decay as a sign of periodontitis, and 31% recognized reversible redness/inflammation as a clinical indication of periodontitis. The majority (92%) of cardiologists agreed or strongly agree that inflammation is a key component between periodontal disease and cardiovascular disease, and 66% agree that controlling infection and inflammation is important for managing cardiovascular disease. When asked about their knowledge about the studies regarding an association between cardiovascular disease and periodontal disease, 50% agreed and 50% were unsure or disagreed. When asked if patients with periodontal disease were more likely to have increased atherosclerosis and risk for myocardial infarction and stroke, 72% agreed (Table IV). Only 39% agreed that treatment of periodontal disease could decrease a patient's risk for cardiovascular disease. However, 72% were interested in learning more about the relationship between cardiovascular disease and periodontal disease. The majority of physicians (71%) agreed it is important for cardiologists' and periodontists to work together to educate their patients about oral systemic disease risks (Table IV). Physicians reported that 20% of their professional education included oral health content. However, 80% reported not receiving any education on oral health care. For the majority of physicians who did receive oral health education, 90% received less than 3 hours. Twelve percent reported having clinical requirements regarding assessments of the teeth or gums, while only 5% reported observing a dentist or dental hygienist. When asked to rate the quality of their oral health education, 69% reported it as poor. 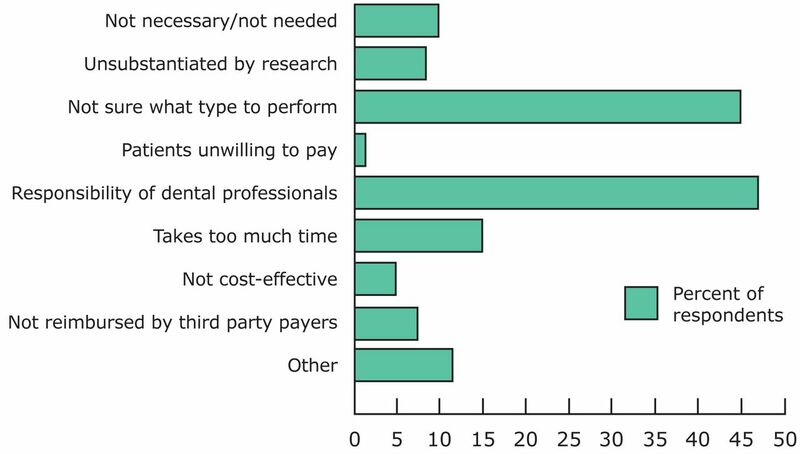 Sixty percent of cardiologists believe that medical and dental students should be trained to work collaboratively, and 39% responded that “maybe” they should be trained to do so (Table V). This study was the first of its kind to question cardiologists about their knowledge and behaviors regarding periodontal disease and the potential association with cardiovascular diseases. While studies have been conducted with other health care providers, cardiologists have not been investigated.25,26,31,32 It has been determined that individuals who have cardiovascular disease and periodontal disease share many of the same risk factors such, as smoking, diabetes, obesity and age.6,10-17 But how this evidence is translated into the clinical practice of cardiologists has not been studied until this investigation. The research team for this study anticipated that more than 16% would be familiar with the guidelines. The most recent statement from the AHA regarding the association of periodontal disease to atherosclerotic vascular disease has gained much attention since it was published in May, 2012; however, the cardiologists in this study did not seem aware of the statement and indicated it had not changed the way they view the importance of oral health. While a cause and effect has not been established between periodontal disease and cardiovascular disease, the statement does support an association between the 2 conditions.23 Clearly more work needs to be done to educate cardiologists about periodontal disease and the potential detrimental effects to systemic health. The relationship between oral health care providers and medical providers is an area that needs improvement. Wooten et al reported that 62% of nurse practitioners and certified nurse midwives conduct an oral exam as part of routine care at initial visits.26 The current study concluded that only 18% of North Carolina cardiologists' conduct an oral exam at the initial visit. Practitioners stated that it is the responsibility of the dentist to perform the exam. Another reason for not doing an exam is that they simply do not know what it entails. This is an area that could be incorporated into medical school education through interprofessional education. With an increase in oral systemic disease, it is important to examine the need for interprofessional education. Wilder et al recommended that faculty development, curricular changes and interprofessional education initiatives be incorporated into dental education. Dental schools should seek relationships with local clinics and private practice dentists and other health professionals.33 The paper reinforces the Commission on Dental Accreditation recommendation that states students should be encouraged and participate in service learning (Haden, personal communication, December 2007). Lopes et al reported that only 21% of diabetes educators received formal education on oral health.31 The current study reported similar findings and concluded that while the majority of respondents did not receive oral health education, they believe it is an important area for students to work collaboratively. An interprofessional education curriculum would provide the atmosphere for collaboration to occur. Interprofessional practice can be improved by providing options for continuing education in the area of oral systemic health. Higher education administrators and leaders should begin examining these areas and incorporating them into health professions curricula. In 1989, Rutgers School of Biomedical and Health Sciences began implementing oral health modules into the second, third and fourth years of medical school. Modules in head/neck examination and oral cancer screenings were incorporated into the curriculum along with rotations throughout the dental school to learn more about oral conditions.34 This study, along with other studies, concluded that oral health is an important part of overall health.25,26,31-34 To provide the best care and practices for patients, multidisciplinary fields need to collaborate. Limitations of this survey include a low response rate. Cartwright investigated response rates of physicians from 19 professional groups. The response rate varied from 56 to 99%.35 Factors affecting response rates included length of questionnaire and the available time to complete it. 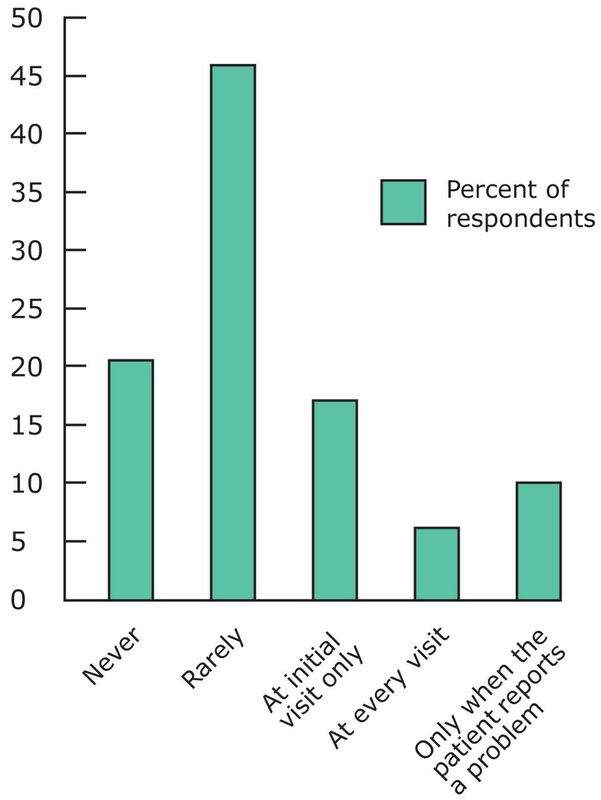 While the method used for the conduct of the survey was a recommended procedure for survey research,30 it is also recognized that busy physicians may not take the time to complete a longer questionnaire or the physicians may not actually see the survey if they do not review the mail. In addition, this sample of North Carolina cardiologists may not be representative of all cardiologists, thus limiting the external validity. However, the study does provide a view of how oral health is incorporated (or not incorporated) into the clinical practices of cardiologists. Future studies should investigate how oral health content can be incorporated into the curricula of medical providers. Other studies might evaluate scenarios where oral health care (dentists and dental hygienists) and medical providers work collaboratively in providing patient care. This study found that North Carolina cardiologists' have some knowledge about periodontal disease but are unclear in other areas. Half of cardiologists' surveyed were unsure that treatment of periodontal disease can decrease a patient's risk for cardiovascular disease. Approximately half of respondents referred 1 to 5 patients to a dental facility for either tooth decay or periodontal disease. Further education in oral diseases will help physicians refer patients to the appropriate oral health care provider. Though North Carolina cardiologists' were not implementing the published clinical recommendations into practice, the majority were interested in learning more about the association between the 2 diseases. Respondents agreed that it is important for health care providers to work together to educate patients on systemic diseases. This project was supported by a grant from the ADHA Institute for Oral Health and the Colgate Palmolive CO.
Megan Mosley, BSDH, MS, graduated in 2013 from the University of North Caroline at Chapel Hill with a Masters in Dental Hygiene Education, and currently works in private practice in Raleigh, NC. Steven Offenbacher, DDS, MS, PhD, is a member of the department of periodontology at UNC School of Dentistry, and is the director of the Center for Oral and Systemic Diseases. Ceib Phillips, MPH, PhD, is a Professor in the Department of Orthodontics at the University Of North Carolina School Of Dentistry. Christopher Granger, MD, is a cardiologist at Duke University. Rebecca Wilder, BSDH, MS, is a Professor and Director of Faculty Development for the University of North Carolina at Chapel Hill School of Dentistry, and also serves as Director of the Master of Science Degree Program in Dental Hygiene Education. The Journal of Dental Hygiene Best Paper Award was created to recognize the most outstanding research paper published from the previous year (2014). All original research papers published in 2014 were evaluated by a panel of judges, using specific criteria, to make the final selection. This manuscript first appeared in Volume 88, Issue Number 5 of the October 2014 issue of the Journal of Dental Hygiene.
. Advancing Oral Health in America. The National Academies Press. 2011. Oral Health in America: A Report of the Surgeon General. U.S. Department of Health and Human Services. 2000.
. Prevalence of periodontitis in adults in the united states: 2009 and 2010. J Dent Res. 2012;91(10):914-920.
. Periodontal disease is associated with higher levels of C-reactive protein in non-diabetic, non-smoking acute myocardial infarction patients. J Dent. 2011;39(12):849-854.
. Periodontal diseases and cardiovascular events: Meta-analysis of observational studies. Int Dent J. 2009;59(4):197-209.
. Commonality in chronic inflammatory diseases: Periodontitis, diabetes, and coronary artery disease. Periodontol 2000. 2006;40:130-143.
. Oral disease, cardiovascular disease and systemic inflammation. Periodontol 2000. 2000;23:110-120.
. Periodontal disease and coronary heart disease incidence: A systematic review and meta-analysis. J Gen Int Med. 2008;23(12):2079-2086.
. Markers of systemic bacterial exposure in periodontal disease and cardiovascular disease risk: A systematic review and meta-analysis. J Periodontol. 2007;78(12):2289-2302.
. The association between periodontal diseases and cardiovascular diseases: A state-of-the-science review. Ann Periodontol. 2001;6(1):9-15.
. Bias induced by self-reported smoking on periodontitis-systemic disease associations. J Dent Res. 2003;82(3):345–349.
. Tobacco use as a risk factor. J Periodontol. 1994;65(5):545-550.
. Periodontal disease: associations with diabetes, glycemic control and complications. Oral Dis. 2008;14(3):199-203.
. Changes in body weight and adiposity predict periodontitis progression in men. J Dent Res. 2012;91(10):921-926.
. The common risk factor approach: a rational basis for promoting oral health. Community Dent Oral Epidemiol. 2000;28(6):399-406.
. Dogenetic factors explain the association between poor oral health and cardiovascular disease? A prospective study among swedish twins. Am J Epidemiol. 2009;170(5):615-621.
. Periodontitis and coronary artery disease: A questioned association between periodontal and vascular plaques. Am J Cardiovasc Dis. 2011;1(1):76-83.
. Summary health statistics for U.S. adults: National Health Interview Survey, 2011. Vital Health Stat 10. 2012;(256):1-218.
. Forecasting the future of cardiovascular disease in the united states: A policy statement from the American Heart Association. Circulation. 2011;123(8):933-944.
. Evaluating periodontal risk for patients at risk of or suffering from atherosclerosis: Recent biological hypotheses and therapeutic consequences. Arch Cardiovasc Dis. 2011;104(5):352-358.
. Toothbrushing, inflammation, and risk of cardiovascular disease: Results from Scottish health survey. BMJ. 2010;340:c2451.
. American Journal of Cardiology, Journal of Periodontology. The American journal of cardiology and journal of periodontology editors' consensus: Periodontitis and atherosclerotic cardiovascular disease. Am J Cardiol. 2009;104(1):59-68.
. Does the evidence support an independent association? A scientific statement from the American Heart Association. Circulation. 2012;125(20):2520-2544.
. The role of the pediatrician in the oral health of children: A national survey. Pediatrics. 2000;106(6):E84.
. North Carolina internists' and endocrinologists' knowledge, opinions, and behaviors regarding periodontal disease and diabetes: Need and opportunity for interprofessional education. J Dent Educ. 2011;75(3):329-338.
. Nurse practitioner's and certified nurse midwives' knowledge, opinions and practice behaviors regarding periodontal disease and adverse pregnancy outcomes. J Dent Hyg. 2011;85(2);122-131. Standards for clinical dental hygiene practice. American Dental Hygienists' Association [Internet]. 2008 [cited 2014 September 26]. Available from: http://www.adha.org/resources-docs/7261_Standards_Clinical_Practice.pdf.
. Dental hygienists' knowledge and opinions of oral systemic connections: implications for education. J Dent Educ. 2012;76(6):682-694.
. Incorporating oral systemic evidence into patient care: practice behaviors and barriers of North Carolina dental hygienists. J Dent Hyg. 2011;85(2):99-113.
. The dillman total design survey method. Can Fam Physician. 1986;32:2366-2368.
. Diabetes educators' knowledge, opinions, and behaviors regarding periodontal disease and diabetes. J Dent Hyg. 2012;86(2):82-90.
. Obstetricians' knowledge and practice behaviors concerning periodontal health and preterm delivery and low birth weight. J Dent Hyg. 2007;81(4):81.
. Is dentistry at risk: a case for interprofessional education. J Dent Educ. 2008;72(11):1231-1237.
. Letters: oral health awareness for osteopathic medical students: a medical and dental collaborative effort. J Am Osteopath Assoc. 2012;112(2):80-82.
. Professionals as responders: variations in and effects of response rates to questionnaires, 1961-77. Br Med J. 1978;2(6149):1419-1421.